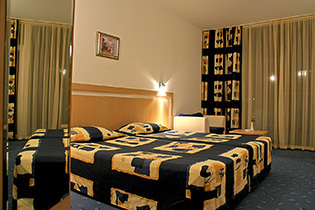 Aqua Azur Hotel offers comfortable accommodation in single rooms. They are elegantly equipped with everything you need for a pleasant holiday. A comfortable bed, TV, practical, good-looking furniture, warm lighting, and internet access - guests who stay in single rooms have all the conditions for recreation and beneficial work.